Graduate students abandoned sections, experiments and labs on Wednesday at UC Santa Cruz. About 150 people rallied in Quarry Plaza as part of the nationwide walkout against the proposed graduate tax in the Republican H.R. 1 tax plan. H.R. 1 would classify tuition waivers received by graduate students for research and teaching as taxable income. As of now, these waivers go directly toward living costs and student fees. 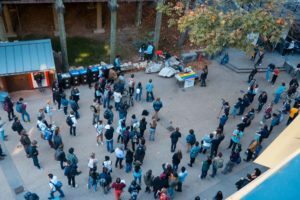 Organizers of the walkout at UCSC demanded Congress reject the proposed tax plan, support higher education institutions and draft a new tax plan that prioritizes higher education. The Graduate Student Association unanimously voted on Tuesday to endorse the nationwide Grad Student Walkout. Oarteze Hunter, a researcher and second-year doctoral candidate in molecular, cell and developmental biology, walked out of an experiment in protest of the graduate tax. “I do graduate research for the university and I create knowledge for the university. I feel like me walking out and putting that to the side for one second and just saying I can have my own voice and be heard is super powerful,” Hunter said. An estimated 30 percent of UC graduate students and their families rely on untaxed waivers. The UC reported that 23,000 graduate students earned $250 million through waivers in 2015-16, an average of less than $11,000 per person. The House passed H.R. 1 with a 227-205 vote on Nov. 16. If passed in the Senate, it would cut corporate taxes by 35 percent while reducing individual deductibles. The bill is now moving on to the Republican-controlled Senate. 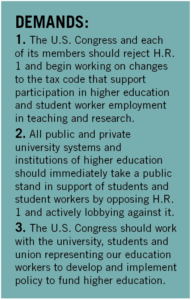 The Senate bill doesn’t include the graduate student tax but it could still be a danger to students if this version passes because the Senate and the House would still need to compromise on the plan before a final vote. 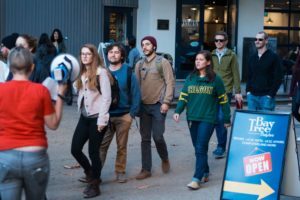 UC President Janet Napolitano wrote letters to both the Senate and the House earlier this month urging them not to support this taxation of graduate students’ waivers. Napolitano, Student Regent Paul Monge and Student Regent-designate Devon Graves released a statement condemning the plan on Nov. 27. Despite this response from UCOP, protesters at Wednesday’s walkout, like teaching assistant and graduate student Karla Cativo, believe UCOP could be doing more to support its graduate student community. The Student-Workers Union urged protesters to call representatives and sign the petition rejecting the GOP tax plan. From private schools such as University of Southern California to public schools such as Ohio State University and UC Berkeley, an estimated 40 walkouts happened across the nation on Wednesday.